Barbershop owner Eric Muhammad (left) takes the blood pressure of customer Marc Sims (right). In a study published in Circulation, researchers have demonstrated that barbershops can be an avenue to sustainably reducing blood pressure. 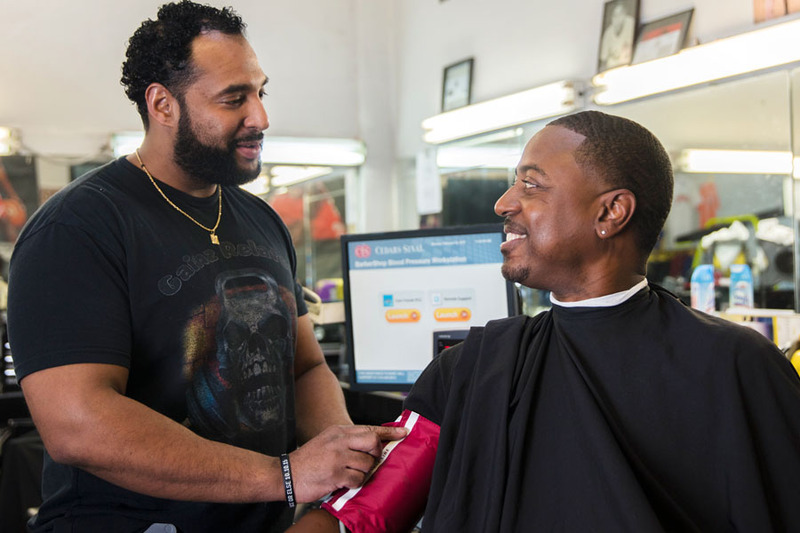 Over a year of treatment, African American men significantly reduced their rates of hypertension by receiving blood pressure testing and prescriptions from pharmacists in Los Angeles County barbershops. Men who received blood pressure checks and prescriptions from pharmacists saw their systolic pressure fall by nearly 30 mmHg, compared to 7.2mm Hg among men who received blood pressure checks and were encouraged to follow-up with a doctor. Further, a BP <130/80 mmHg was achieved by 68.0% of the intervention group versus 11.0% of the control group (P<0.02). All men in the study received lifestyle information from barbers, who were trained as health educators for the project. The Los Angeles study was led by the late Dr. Ronald Victor, CTSI community and engagement investigator and professor of medicine at Cedars-Sinai Medical Center. A previous study also led by Dr. Victor and published in NEJM, reported six-month data that is statistically indistinguishable from the 12-month data. Vanderbilt Institute for Clinical and Translational Research will serve as a partner in the Nashville-based study alongside community stakeholders. The success of the LA barbershop study has led to $978,501 in NIH NCATS supplemental funding to expand and build a network of eight barbershops in Nashville, Tennessee in partnership with the Vanderbilt CTSA hub and community stakeholders. The multisite collaborative project directly addresses the third goal of the NCATS CTSA program to promote the integration of special and underserved populations in translational research on a national scale. As with the Los Angeles-based study, Nashville barbershop research hubs will target African American black men, an at-risk and particularly hard-to-reach special population, in a city with worse overall health statistics than Los Angeles. The Nashville study aims to execute a smaller scale study by recruiting 50 barbershop patrons with uncontrolled hypertension. Researchers will conduct and evaluate the barbershop research methodology and the UCLA CTSI data coordinating center will handle data management and statistical analysis. Upon completion, a tool kit will be created to provide researchers with the ability to establish barbershop research hubs in local and multi-site clinical research across the CTSA network. Additionally, should the Nashville study yield positive results, it will provide critical pilot data in submitting the barbershop methodology for a NIH grant on large scale implementation research across multiple CTSA hubs.